Developed by Neptune Team from Compile Heart as part of the 1st Title from Galapagos RPG project. Has big name like Yoshitaka Amano, Nobuo Uematsu, and Tsunako as part of the game development staff. The number of Take That lines in the anthem are just hilarious. For oldschool JRPG fans, this is like a promising return-to-form JRPG considering the names involved. I'm still not certain of the difference between something super-niche like Neptunia and a "Galapagos RPG". Fairy Fencer F’s story is about a goddess and an evil god and when the game begins royal principles have been twisted for evil. The battle system is an evolved version of Neptunia’s battle system. Characters can do mid-air combos and team attacks that can knock an enemy off their stance. It looks the exact same, except with a different setting... I'd hope that they've been able to fix some of the problems with the Neptunia series if nothing else (like having more than six dungeons, or having real, honest-to-goodness towns!) but given that this has probably only been in development for a few months and is supposed to be out this year I wouldn't hope for much. Basically, if you're looking for a classic, old-school RPG, you should be as far away from here as possible. Go get Bravely Default or something. Last edited by Tyabann; 2013-05-08 at 11:43. Nobuo Uematsu is having part in developing this game! I'm so following this. I love the Neptunia series and I'm sure this will be great. By the words in bold, you mean no repeating dungeon design? Is it just me, or I see Silver Nepgear there? Last edited by Scarletknive; 2013-05-12 at 08:09. Chances of getting English version? It is part of the brand called "Galapagos RPG". From their mission, the chances of getting English version is highly unlikely. They clarified later (with Siliconera even) that they still plan to bring those overseas. It's more of a concept than an actual "limitation". I can see NISA translate it. I've seen some, but the game parts images are those with worst quality. I managed to look and read the character pages, but even those are only partially readable (Tiara's profile is the only that can be read in full). Glad to see that the environments and enemies aren't being recycled from Neptunia. God know how much internal recycling the game will do though. 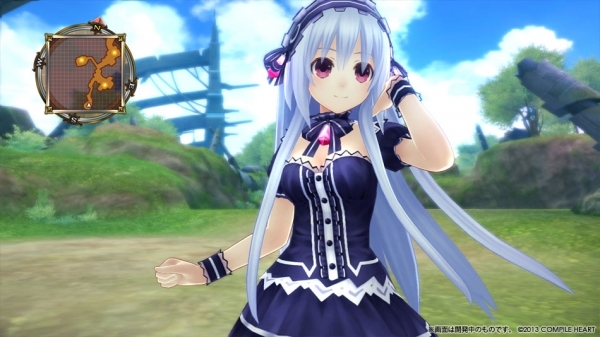 Fairy Fencer F will launch for PlayStation 3 in Japan on September 19, this week’s Famitsu reveals.